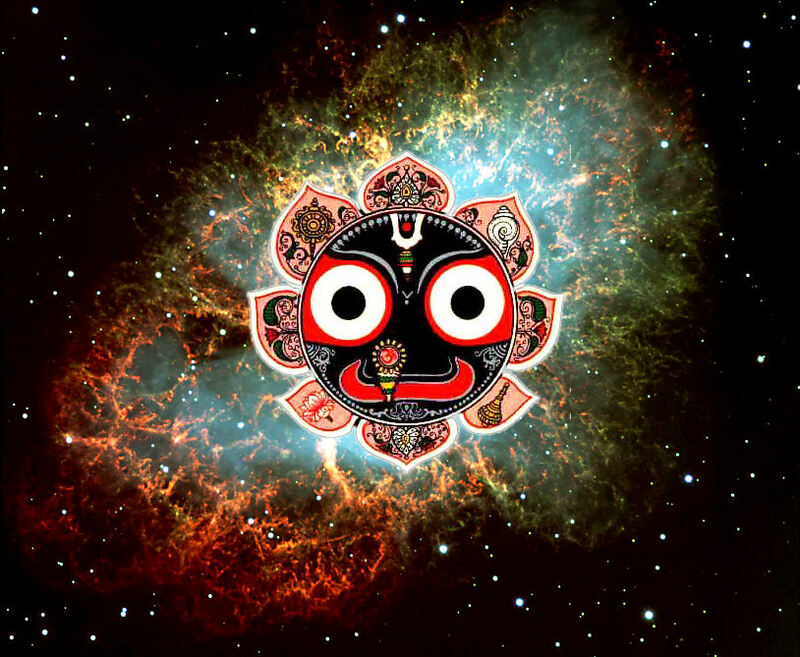 Jagannatha Swami nayana pata gami bhavatu me! 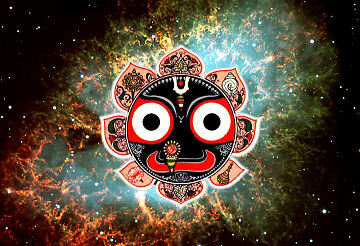 "O Jagannatha, Lord of the Universe, please be visible before my eyes." Five thousand years ago, Lord Krishna, with His elder brother Balarama and His younger sister Subhadra, once visited Kurukshetra in a chariot. 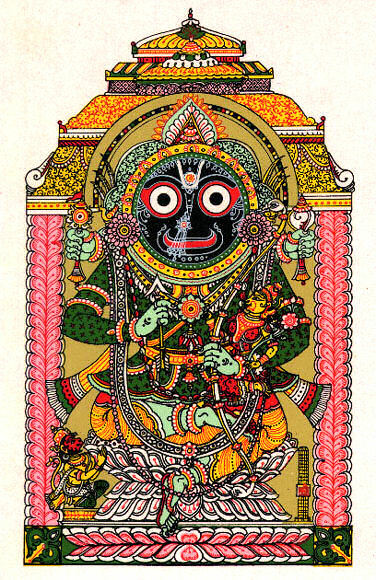 Two thousand years later, King Indradyumna started the temple of Jagannatha in Orissa at Puri, and he wanted to establish a picture in the temple of Krishna, Subhadra, and Balarama coming to Kuruksetra in the chariot during solar eclipse. He employed Visvakarma to carve them from wood, and made a contract with Visvakarma that the sculptor would do his work behind closed doors and the King should not disturb him. But the King, being very impatient to see, forcefully opened the door. Visvanatha stopped carving, but the king decided, "Never mind it is half finished. I shall install these deities in the temple." Since then, the three deities Jagannatha, Balarama and Subhadra are being worshiped in India at Jagannatha Puri. 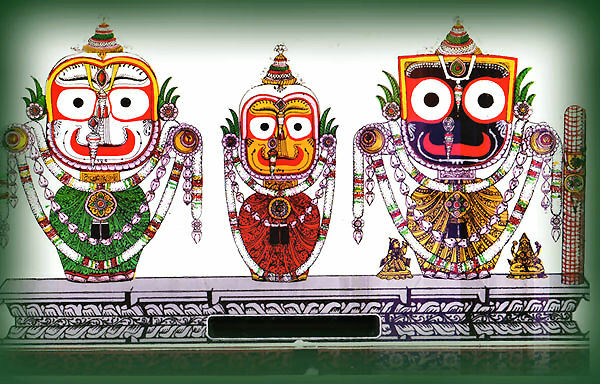 The significance of Jagannatha Puri and the story of how the Deities first appeared goes back many hundreds of years to the time of King Indradyumna, who was a great devotee of Lord Vishnu. It is related that one time in his court the King heard from a devotee about an incarnation of Lord Vishnu, named Nila-madhava. (Nila-madhava is the Deity form of Lord Vishnu.) The King very much wanted to see this form of the Supreme and sent many Brahmanas to search for Nila-madhava. All came back unsuccessful except for Vidyapati, who did not come back at all. He had wandered to a distant town which was populated by a tribe of people known as Shabaras of non-Aryan heritage. He had stayed in the house of Visvasu, and later, at Visvasu's request, married his daughter, Lalita. After some time Vidyapati noticed that Visvasu would leave the house every night and return at noon the next day. Vidyapati asked his wife about this. Though her father had ordered her not to tell anyone, she told Vidyapati that Visvasu would go in secret to worship Nila-madhava. After repeated requests, Vidyapati finally got permission to go see Nila-madhava, only if he went blindfolded. But Vidyapati's wife had bound some mustard seeds in his cloth so that a trail could be left to follow later. When they reached the shrine, Vidyapati saw the Deity Nila-madhava after the Shabara took off the blindfold, and he felt great ecstasy. 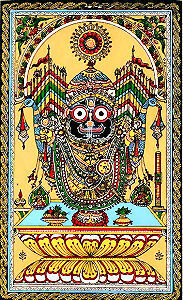 After great endeavor, King Indradyumna built the temple at Sri Kshetra, now known as Jagannatha Puri, and later prayed to Lord Brahma to consecrate it. However, Lord Brahma said that it was not within his power to consecrate the temple since Sri Kshetra is manifested by the Supreme's own internal potency and is where the Lord manifests Himself. So Brahma simply put a flag on top of the temple and blessed it, saying that anyone who from a distance saw the flag and offered obeisances would easily be liberated from the material world. 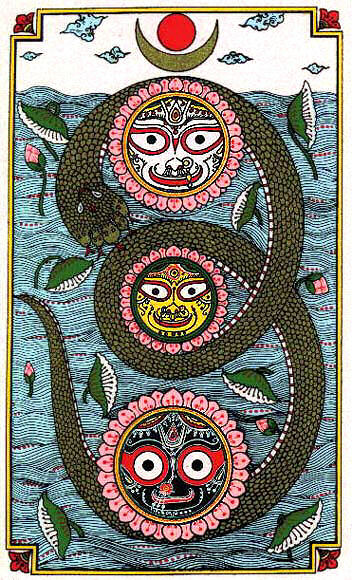 Nonetheless, after much waiting the King became anxious since Nila-madhava had not manifested Himself. Thinking his life was useless, the King decided he should end his life by fasting. But in a dream the Lord said that He would appear floating in from the sea in His form as Daru-brahman. The King felt he had committed a great offense for having opened the doors before the allotted three weeks had passed, so he decided to end his life. 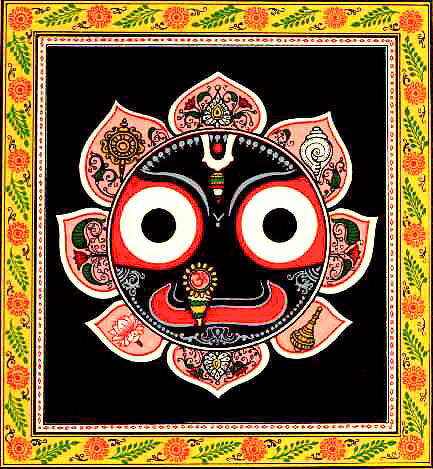 But in a dream Lord Jagannatha told the King that though he had broken his promise, this was just a part of the Supreme's pastimes to display this particular form. The King was told that this form, even though it appeared to be incomplete, was actually the form of the Lord that was meant to be worshiped in this age of Kali-yuga. Occasionally the King could decorate the Deity with golden hands and feet. 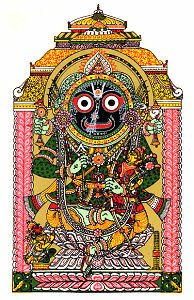 Yet those devotees filled with love would always see the form of Lord Jagannatha as the threefold bending form of Syamasundara, Krishna, holding a flute. 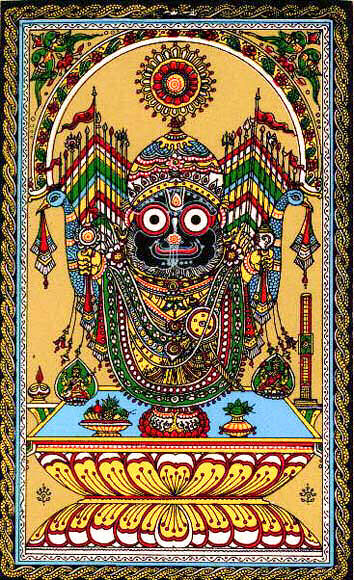 Thus, the Supreme appeared in this form so that people could approach and see Him, especially as He rides through town on the huge carts during the Ratha-Yatra festival. Ratha yatra is a celebration of the occasion when Sri Krsna (Lord Jagannatha) attended a religious function in Kuruksetra some 5,000 years ago, traveling from Dwarka in a big chariot along with Subhadra and Balarama. In remembrance of that event, the car festival takes place in Jagannath Puri every year, and millions of people go there to participate. Today, ratha yatra festivals are performed at temples around the world, and they are one of the paraphernalia of our Krsna Consciousness movement because they revive our consciousness about Krsna. 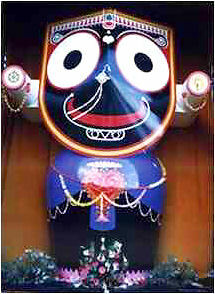 Each year in Jagannath Puri, three enormous chariots are built anew for Lord Jagannatha, Balarama and Subhardra. Over 1,000 logs are brought from the Dasapalla and Ranpur forests, and more than 100 carpenters work for two months constructing the three chariots. A local mill provides nearly 2,000 meters of cloth each year, and the chariots are radiantly draped in color. Very strong coconut fiber ropes, 8 inches in diameter, are used by the devotees to pull the chariots along the parade route. The nails, brackets and fixtures are all made locally, and the smiths work for a month on them. The ratha's main structure (above the wheels) contains eighteen pillars and roofs. Each chariot holds nine parswadevatas (subsidiary deities), two dwarapalas (door keepers), one Sarathi (charioteer) and one presiding deity of the crest banner (dhwaja devata), and all are made of wood. In Oriya, the language of Orissa, the word "yatra" means journey, or tour. 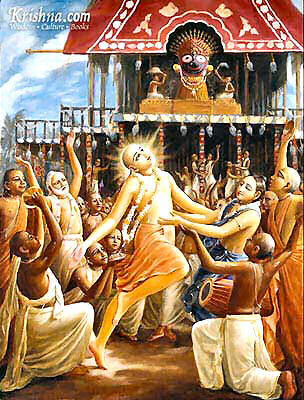 Yatra might be performed on foot (pada yatra), by train, or by air (vimana yatra). Advanced devotees are also able to perform invisible yatra, traveling with the subtle body. 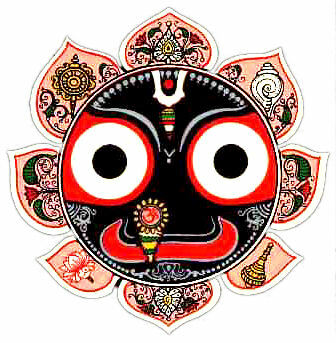 For Lord Jagannatha's ratha yatra, the means of transport for Lord Jagannatha, Balarama and Subhardra is by way of chariot, or 'car'. This chariot vehicle is known as "ratha". 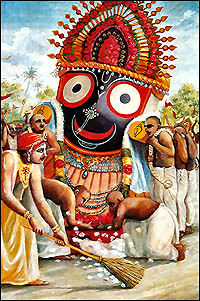 Once each year, for a period of about 15 days, Lord Jagannatha travels out to spread his mercy. 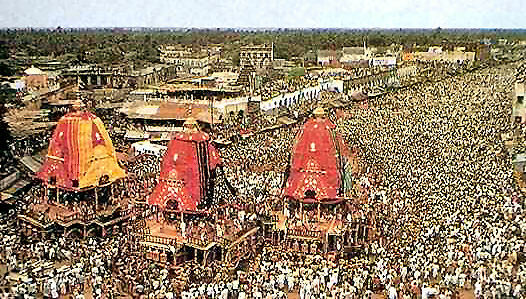 Those who have the good fortune to view the Jagannatha deities, or who help to pull the chariots along on their ropes, are benedicted by the Lord during the ratha yatra parade. Srila Prabhupada said, "Therefore if you participate in these car festivals, as it is stated in the scriptures, rathe ca vamanam drstva punar janma na vidyate... If you kindly see these Jagannatha deities riding on these cars and in procession, and as Caitanya Mahaprabhu chanted the Hare Krsna mantra in front of this car, then according to our Vedic scripture, in your next life you'll go to back, back to home, back to Godhead."